One of the streets of Xiangelila's old town. Also known as Gyelthang, it might be compared to Shangri-La, a paradise surrounded by snow-capped mountains. WHEN NOVELIST James Hilton released "Lost Horizon" in 1933, he couldn't have dreamed that his tale of Shangri-La would inspire two feature films and launch seven decades of speculation on the existence of a real Tibetan Eden. Hidden somewhere in the Himalayas, he wrote, a paradise of peace, learning and eternal life lay waiting for a repentant world. "Look at the world today. Is there anything more pitiful? What madness there is! ... A time must come, my friend, when ... brutality and lust for power must perish by its own sword. ... When that day comes, it is our hope that the brotherly love of Shangri-La will spread throughout the world." OUR VAN SKIDS to a halt as a herd of yaks ambles through snow patches on the roadway. We are on the outskirts of Zhongdian, also called Gyelthang, and more widely known as Xiangelila. Literary investigators with the Deqen Tibetan Autonomous Prefecture in Yunnan province claim without hesitation that Xiangelila is indeed Hilton's Shangri-La, matching scenic points with the book's geographic descriptions. Surrounded by the snow-capped mountains Baimang, Meili and Haba, the farmlands stretch across the Tibetan Plateau, with some villages at 11,000 feet above sea level. My nose has been bleeding for three days. "Every generation surrenders one son to the spiritual life," he says, "and I was overjoyed to be chosen at the age of 11 to join my brethren." The author poses with a trio of monks. Every generation of family surrenders one son to the spiritual life. Now 24, Lahso hopes to spend the rest of his life at Dongzhulin, chanting for peace. The monastery is faded and needs repairs, but as word is spread by the Yunnan Tourist Authority, the monks hope more visitors will create a steady flow of renmenbi into their coffers. Lahso has not read Hilton's book, but he's not surprised that foreigners find his hometown a paradise. "Welcome to Shangri-La," reads a banner, in English, over the front door of the Yak Café in central Xiangelila. Outside, one in Chinese says, "Mind your manners. Remember to be friendly." 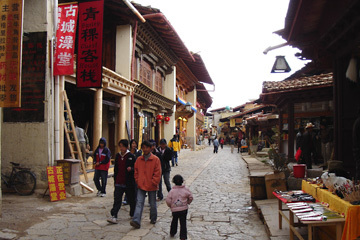 All of Yunnan province is bracing for more visitors. The locals are counting on curiosity to bring tourists to the outer regions after the Summer Olympic Games in Beijing two years from now. Besides, who hasn't heard of Shangri-La? 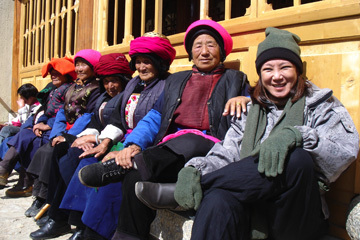 Pamela Young, right, takes time to relax with Tibetan women in turbans. The Yak Café is a tourist bar that doesn't actually serve yak, though horns and pelts are part of the decor. Diners who wish to see the beasts basted in butter don't have far to go. Yak jerky with whole red peppers is the plat du jour in these parts. It is tough and oily yet exotically tasty. Also on the table, a Tibetan hot pot filled with chicken broth, cabbage, tofu and mung bean threads. There are bowls of duck with peppers, pork with peppers, mushrooms with peppers and, of course, assorted peppers, fried in yak butter. Xiangelila produces bi jyou, a white liqueur, but we opt for Dali beer. As we order another round, the lights suddenly flicker and go out. "Oh, it's just the town square," the waiter says. "They're testing the PA system." With not enough electricity to go around, the restaurant and surrounding shops do without for an hour or so while the evening's entertainment is prepared a few blocks away. Each night, up to a thousand villagers crowd into the square for folk dancing. "You don't want to see this," says our waiter. "It's just old people and farmers and students dancing to recorded music. The Golden Flower Hotel has a tourist show with beautiful girls in colorful costumes." We drain our Dali mugs and make our way through the dark to the square. The old women line up in their Tibetan finery, behind them a row of long-haired male students. In the center, toddlers tumble and play tag with the keeper of the fire, a weathered, toothless Tibetan in dungarees. He stokes a cauldron of smoking lumber that lends more warmth than light to the square. For two hours, Xiangelila residents hold hands, dance and sing by fire-glow. They pull spectators into the circle, our blood-tinged noses marking us as gringos. Soon we are light on oxygen but heavy with laughter. We are dizzy on Dali beer, the frigid night air and the "brotherly love of Shangri-La." Perhaps James Hilton never stepped foot on these stones, but on this night we are convinced that Shangri-La does exist. If not here, then in the heart of any wanderer moving to music under a Tibetan moon. Pamela Young's "Mixed Plate in China" begins tomorrow on KITV News at 5, continuing through Thursday. A China/Hawaii business series will also air at 5 p.m. May 22 to 24.